Learn how to use and chainsaw effectively and safely. Peter Wolstencroft, a tool expert from Alexandra Tool Hire will guide you, step by step, through the important measures to take when operating the chainsaw. Hi, we are Alexandra Tool Hire. My name is Pete and I’m going to give you some tool tips. 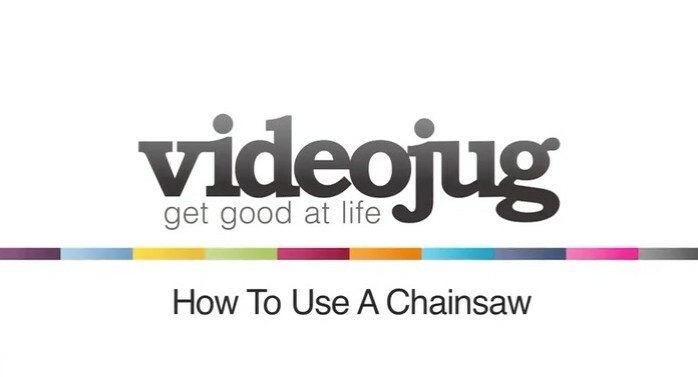 This is a video on how to use a chainsaw. Okay, before we can go to the chainsaw, what we need to do is look at the clothing. This is very important clothing and it must be worn. Okay, first of all, there is something here called trousers. In here is a special material, okay? It’s like a Kevlar material, so if you are using the chainsaw and it does get caught up in the chain, okay? What it does is, it wraps around the chain and it cuts the chainsaw out. Okay, what these do, these slide over your legs and go to your waist, and you usually wear a belt around there and they will be held up, up right here. Okay, let’s go to the next bit. Okay, these are called spats. What these do, they go just over your boots, and what you do is you clip them over, and they go around, you tie them on. There is one for each leg, to put on there. Finally, you put your helmet here. Okay, this has got a visor right here, to stop any chippings from going into your face. You also have ear-defenders there that go over your ears, because the chainsaw is quiet deafening. Also you have a hat here for safety just in case anything does fall on your head. Okay, once you have all that in, you are ready to go to the chainsaw. Okay, let’s go to the chainsaw here. Okay there is some safety aspects that I want to go through with you okay? When using the chainsaw okay, you can see the chain here, it’s a nice sharp chain so be careful. Okay, so when you are using it, never cut with the tip of the chainsaw, okay? Otherwise you get something called a kickback, what it does is it makes the chainsaw actually kick back to the body, okay? So when you are actually cutting through the branch. Let’s just imagine this is a branch. Make sure you keep it back to the spikes and you are cutting right to the back of the chainsaw, and this will stop any kickbacks. Okay, also when you are cutting, make sure the ground is completely clear, there are no logs, stones or anything around you, and you got a clear, there are no animals or little children around as well. Okay, make sure your feet are positioned well, okay? So you have them slightly apart and your arms, sort of on the handle in this sort of, this position. So when you are using the chainsaw you have a firm grip on the chainsaw. Also, make sure your hand is always on the top handle. It’s got a safety brake up here and if something does go wrong, then at least, your hand is up here and that will just click it and stop the chain actually going around. So, just make sure you have a firm grip, your knuckles are here, so if anything does go wrong you can click back, and it stops the chain instantly. Okay, the second position, the chains on its side, put your hand here. And your other hand here. Make sure your body is here and its clear around this area here so if you do get a kickback, when it does swing around it will just swing into open air and nothing will be there. And that’s how to use a chainsaw.